(U//FOUO) The Taliban operatives were disguised as Muslim females wearing burqas – full-bodied cloaks worn by some female Muslims – and were armed with suicide vests, assault rifles, and rocket-propelled grenade launchers. Upon entering the Spoghmai Hotel, an upscale resort in Kabul frequented by wealthy Afghans, the Taliban team killed two Afghan security guards at the hotel’s front gate, then took nearly 40 Afghans hostage. At least 12 Afghan civilians were killed during the siege, as well as the two security guards, a policeman, and the five attackers. 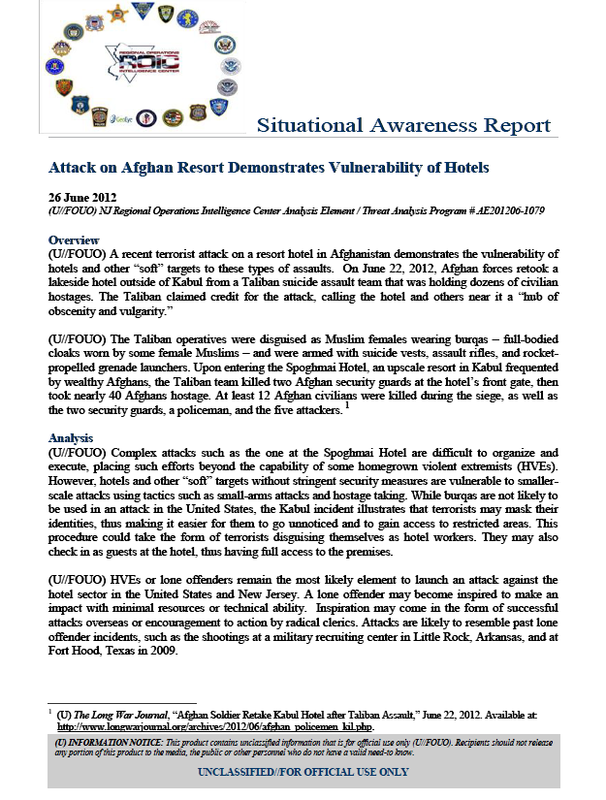 (U//FOUO) Complex attacks such as the one at the Spoghmai Hotel are difficult to organize and execute, placing such efforts beyond the capability of some homegrown violent extremists (HVEs). However, hotels and other “soft” targets without stringent security measures are vulnerable to smaller-scale attacks using tactics such as small-arms attacks and hostage taking. While burqas are not likely to be used in an attack in the United States, the Kabul incident illustrates that terrorists may mask their identities, thus making it easier for them to go unnoticed and to gain access to restricted areas. This procedure could take the form of terrorists disguising themselves as hotel workers. They may also check in as guests at the hotel, thus having full access to the premises. (U//FOUO) HVEs or lone offenders remain the most likely element to launch an attack against the hotel sector in the United States and New Jersey. A lone offender may become inspired to make an impact with minimal resources or technical ability. Inspiration may come in the form of successful attacks overseas or encouragement to action by radical clerics. Attacks are likely to resemble past lone offender incidents, such as the shootings at a military recruiting center in Little Rock, Arkansas, and at Fort Hood, Texas in 2009. (U//FOUO) The threat to the hotel industry in New Jersey and the surrounding region is high because of frequent attacks domestically and internationally, and the potential threat from HVEs to the hospitality industry. As military and government facilities continue to improve their security measures, terrorists are likely to target hotels and other facilities that are easier to attack. While numerous terrorist groups have expressed the intent to target the United States, the NJ ROIC is unaware of any group that has specifically mentioned the hotel sector in New Jersey as a potential target. Law enforcement and private-sector security personnel should remain vigilant for suspicious activity that may be indicative of terrorist activity. (U//FOUO) A review of the New Jersey Suspicious Activity Reporting System (NJSARS) related to the hotel sector for the past 12 months shows little activity reported. Bergen County reported the most suspicious events with three SARS during this period, followed by Atlantic, Middlesex, and Ocean counties with two SARS each respectively. In total, there were 16 suspicious incidents reported in a 12-month period.